Giallo. Croco. Cuoio. 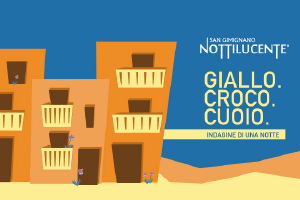 is a urban mobile treasure hunt designed for the Nottilucente 2104 festival in San Gimignano. Players are taken to A.D. 1267 and take on the role of counselors of the mayor to solve the the riddle of the mysterious disappearance of a leather bag full of saffron. Following the clues through the streets of San Gigmignano the players learn something about the medieval age in the city.